Before The Walking Dead and before World War Z, there was only one big zombie franchise. It all started in 1996 with a little game on the Playstation 1 and it soon grew into so much more. 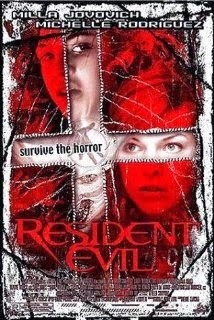 For today's movie we decided to watch the first installment of Resident Evil. Not sure if we are going to watch the rest of them during our month of #undeadOctober so I won't go into any details about the other movies in this review. And even though I have read a few of the books, played all of the games, and watched all of the other movies (multiple times), I will try not to let any of that bleed into this article. For movies based on a game, this has to be one of the best. It didn't directly follow the story of the game, but it did a lot to fill in the world around it. Basically there is everyone's favorite corporation, Umbrella, and they want to make the world a better place. They have grown and grown until they are in almost every industry and are a world wide leader in medical research. The research is of course also planned for military use and when a strain of the virus is released into the facility, known as the Hive, events quickly spiral out of control. The story and idea of the virus and it's release make for a great movie. I have already watched this movie a bunch of times and I do not think that this will be the last. Time for the zombie review! The zombies in Resident Evil are very iconic in that they are whatever the story needs them to be. For this review though, I will stick with what they are as they pertained to this movie. The T-Virus causes its victims to reanimate once they die. Once reanimated, they feel no pain, have increased strength, don't bleed, and have a huge hunger for flesh. This zombie virus is one of the few that can and does affect other animals with varying effects. The virus can also cause unstable mutations which leads to a creature like the Licker, which is a monstrous humanoid that walks on all fours. It is easy to recognize by its brain being exposed and its namesake tongue that it uses as a weapon. As far as zombies go, they might have a few technical issues, but the story is what turns this into a great movie for me. If you have not seen it yet then you must be living under a rock. And since you are living under a rock, how are you reading this anyway? We are not running out of steam yet so make sure to keep checking back. I ordered some DVDs from Amazon so we have a lot more zombie movies on the way for more #undeadOctober fun.